An MP has described an armed robbery in his constituency by men believed to be brandishing handguns as an "absolutely horrifying attack". 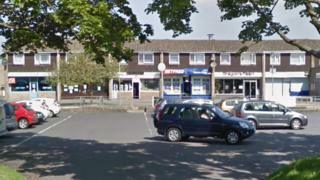 Two balaclava-clad men entered the post office in Burwell Drive, Witney, at 09:00 BST on Saturday. A 31-year-old from Witney has been arrested on suspicion of robbery, but searches continue for the second man. Witney MP Robert Courts called on witnesses to help bring the "aggressive and violent" offenders to justice. He said: "It's an absolutely horrifying attack on people who were at the heart of their community, working hard to help those around them. "It's utterly unacceptable that people who are just going about their jobs are subjected to such violent attacks." The offenders threatened staff during the robbery, and got away with an undisclosed quantity of cash. Det Con Graham Lea said: "I believe after the incident, the offenders made off on foot along Burwell Drive in the direction of Thorney Leys, and so I am also appealing for anybody who may have dashcam or CCTV footage of these men to contact us. "We are continuing to treat this as a top priority to locate the offenders, and there will be a continued increased police presence in the area."